Nothing says bright and sunshiney television than a series about a parent trying to find their long-lost missing child, am I right? One of the most recent entries into the “depressing drama” sub-genre is the BBC and Starz’ upcoming limited series The Missing, which recently unveiled the above full-length trailer, offering audiences a deeper look into this tale of cold leads, failed relationships and a promising hunt for justice. Thankfully, it’s all anchored by Irish actor James Nesbitt (The Hobbit films), whom I will always associate with the stellar 2006 miniseries Jekyll. In The Missing, which doesn’t even have an IMDb page for some reason, Nesbitt plays Tony, a father who can never forget the fateful day when his son Oliver went missing on a family holiday in France. The ensuing search for Oliver not only breaks Tony’s mental state, but it destroys his marriage with Emily (Frances O’Connor) and presumably many other areas of his life. As the trailer shows us, The Missing takes place in two different time periods; one is obviously right around the time of the disappearance, and one is eight years later, once Tony seemingly stumbles upon new clues after revisiting the same hotel they vacationed at. 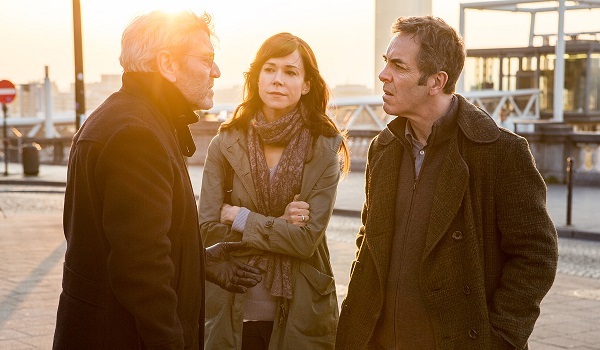 This latter series of events reconnects him with Julien (Tcheky Karyo), the retired French detective who was in charge of Oliver’s case. With new signs of hope emerging, the case is reopened, and Tony and Emily are forced to reconnect in a completely different light. The basic idea behind this series seems to be “Never Give Up,” and that’s a strong one, even if it doesn’t really apply to the majority of people whose kids have been missing for years. This is the kind of mystery I absolutely love, and I’m encouraged by the trailer’s focus on hope and perhaps even eventual happiness. After brightness-smothering projects like Prisoners and The Killing (among others), it’s nice to see that The Missing isn’t solely interested in being the most downtrodden thing on TV. There are a few details that pop up in the trailer that seem to present different avenues of investigation. 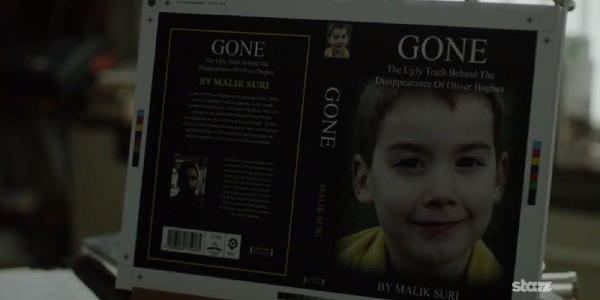 For one, the book seen above, written by Arsher Ali’s character Malik. Who is this guy? We hear Tony and Julien talking about trafficking, perhaps implying that Oliver was transported to a different country. And we also see search groups tearing through wide open areas, though that’s probably footage from soon after Oliver's disappearance. What happened to Oliver, dammit?